2019 has been a dream year for stock investors after 2018 was a nightmare for diversified investors. While 2018 wasn’t a disaster for stocks, very few asset classes increased in value. Amazingly, the S&P 500 is now up 8.7% year to date. Many investors didn’t foresee the economic recovery as evidenced by some of the recent data points. It was tough to navigate the market without government economic data during the shutdown. Many have recognized the economic improvement. However the current market has gotten very overbought, preventing me and others from being positive in the short term. CNN fear and greed index increased from 61 to 64 which signals greed. S&P 500 is about to go over its 125 day moving average which should put the fear and greed index above 70. The 14 day relative strength index is at 63.83. 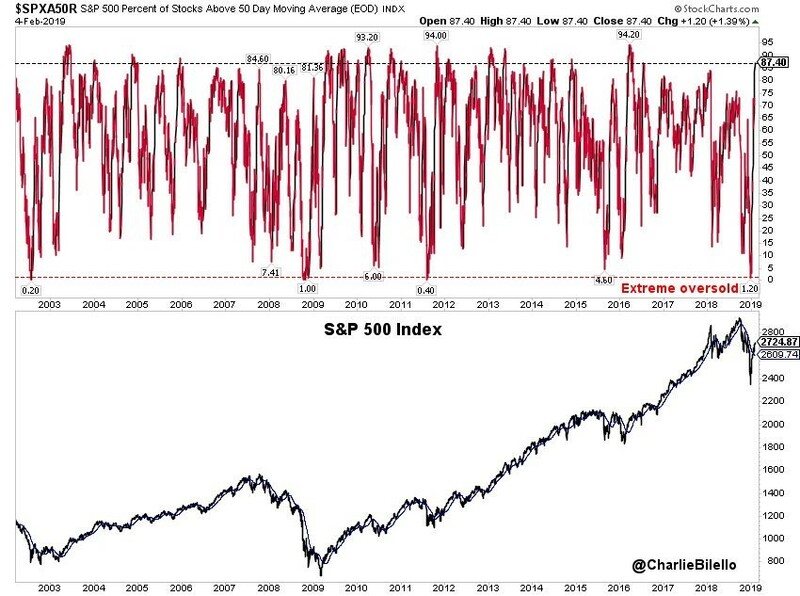 That's very close to 70 which signals the market is overbought. As you can see from the chart below, the S&P 500 is up 16% since the Christmas Eve low. At the low, only 1.2% of S&P 500 firms were above their 50 day moving average which was an extremely oversold moment. Now there are 87.4% firms above their 50 day moving average which means stocks are very overbought. A few more rallies could make this a historic moment. Materials and healthcare were the only losers on Monday as they fell 0.23% and 0.34%. Biggest winners were technology and communication services as they were up 1.6% and 0.95%. The latter should be hurt on Tuesday by Alphabet as it sold off on earnings after hours. S&P 500 was up 0.68%, the Nasdaq was up 1.15%, and the Russell 2000 was up 1.03% on Monday. 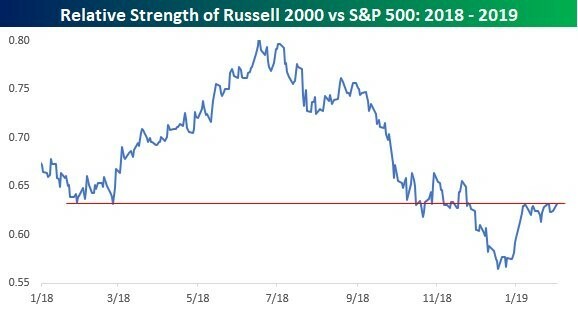 As you can see from the chart below, the relative strength of the Russell 2000 versus the S&P 500 is on the cusp of starting a new uptrend. The bottom in this relationship could be a bullish signal because the top forecasted the peak in the S&P 500 a few months before it peaked. Russell 2000 is now up 12.53% year to date. It would be interesting if small caps outperform because I think the dollar is on the cusp of a big downtrend. The dollar is currently down 0.34% year to date. That’s not to say small caps can’t outperform. They should because America is doing well compared to other developed economies. Plus, international technology stocks in the S&P 500 have been seeing weakness in China. Alphabet reported EPS of $12.77 which beat estimates for $10.82. It reported $39.28 billion in revenues which beat estimates for $38.93 billion. It also had lower than expected traffic acquisition costs as they were $7.44 billion instead of $7.62 billion. They were up 13% sequentially and 15% yearly. An example of a TAC would be Alphabet paying Apple for Google to be the default search engine on its devices. Even with these great headline results, the stock fell 2.84% after hours. The stock is up 6.21% year to date which is less than the overall market, so it’s not as if the stock came into the report running hot. The stock fell because of increased competition from Amazon. Cost per click fell 29% year over year and 9% sequentially. Its capex was over $7 billion which was much higher than estimates for $5.63 billion. Operating margins fell from 23% last year to 21%, missing estimates by 1%. Google’s operating margins fell over 2% in the full year. Advertising revenues were up 20% to $32.6 billion. Alphabet Stock - It’s interesting that Amazon hurt Google, but Amazon also had revenue guidance weakness. 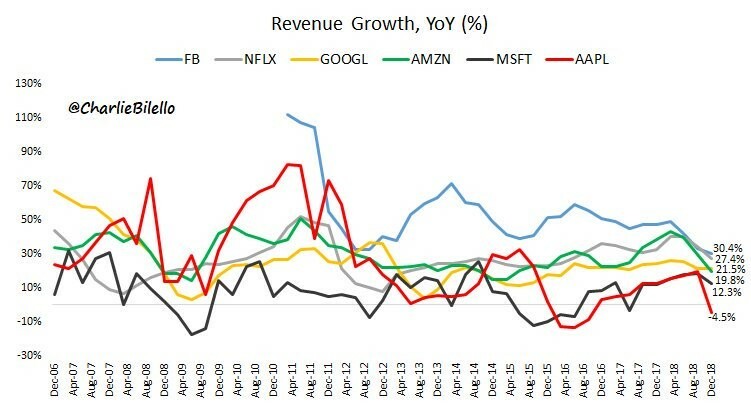 The chart below shows the broad deceleration in revenue growth from all the FAAMNG names. Either the law of large numbers is caching up to these businesses or this is emblematic of economic weakness. Facebook is my favorite of the group and Apple is my least favorite. Once again cloud showed strength as the firm stated it was one of its fastest growing businesses. Furthermore, it is part of the Other Revenues category which had 31% growth. It reported $6.49 billion in revenues, which beat estimates by $60 million. The Other Bets category is its moonshot projects that are small, but can become game changers. This includes businesses like the self-driving car company Waymo and the healthcare startup Verily. It appears sentiment around self-driving technology has become skeptical as many believe cars will never reach full autonomy. A latest trend in mobility is scooter rentals. The category of micro-mobility is getting extreme hype. Overall, this Other Bets category had 18% revenue growth. Revenues were $187.4 million which beat estimates for $154 million. Some of these businesses are pre-revenue, so that might not be the best metric to review this segment. That explains the relatively low growth rate. 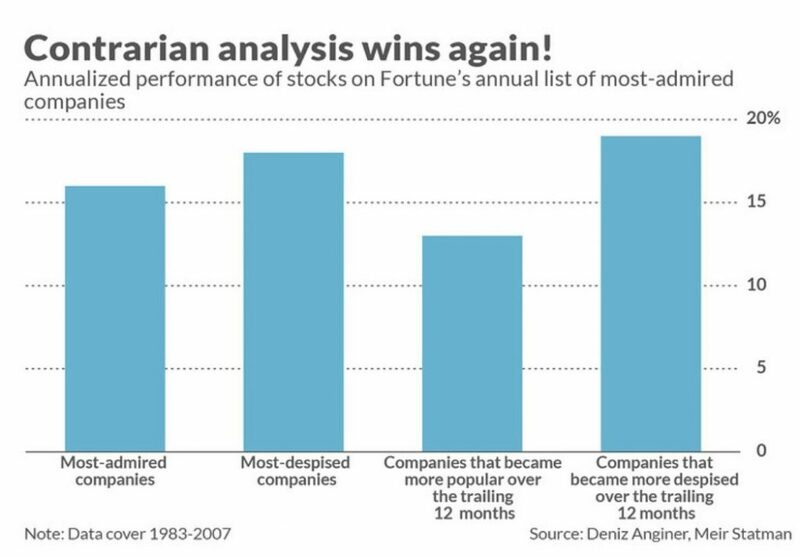 According to a 25 year study through 2007, firms that are despised the most outperformed the most admired companies. Companies that became more despised over the trailing 12 months beat out the ones that became more popular. This is probably because popularity is fleeting while profitability with a strong moat is great for investors. For example, defense contractors and cigarette companies have great businesses, but are hated. Firms in the consumer products industry may be loved one moment and forgotten the next. Facebook has quickly become extremely hated. But its users are staying with the platform even with the negative publicity. The fact that it is a big deal to delete your Facebook account shows how high the switching costs are. Only using Twitter and Snapchat isn’t a great option for Facebook and Instagram users. I will rank the FAAMG stocks in order of the ones I like the most. They are the following: Facebook, Alphabet, Microsoft, Amazon, Netflix, and Apple. The top 4 are all great companies, while the bottom 2 don’t have great long term fundamentals.